Can you believe that we are just a few short weeks away from Thanksgiving and Christmas? Already the Christmas decorations are pushing out the Halloween decorations for shelf space at your favorite store. The race is on to make sure you have a wonderful holiday season. Of course, that means a lot of coordinating schedules with family members, decorating the home and all that shopping. The last thing you want to worry about is clearing out clutter in the garage or making space in the guest bedroom. Those are two tasks that are best suited for Junk King Birmingham. One session with these professional junk haulers will have your home junk free in a matter of minutes. 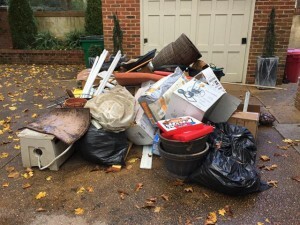 Junk King Birmingham takes all the hard work out of getting rid of your unwanted clutter. Actually, they turn that hard work over to their dedicated moving crews. You’ll be assigned at least two of these capable movers to do all the lifting and loading of your stuff. When the crew shows up at your house, you’ll take them on a quick tour of all the things you want to get rid of. You could have something down in the basement, an upstairs bedroom or even in the backyard. You don’t have to bring it together in a pile. It can stay right where it is until the junking crew whisks it away. After they’ve size everything up they’ll be able to present you with an estimate. Junk King Birmingham’s pricing policies are based on volume. It comes down to how much room your stuff will fill on the back of the truck. You’ll never be charge by the pound or be told that something is too heavy to move. All the Junk King is focused on is making sure you’re completely satisfied and that always happens when you can get rid of junk. Everything that’s collected by Junk King Birmingham will have the opportunity to be repurposed. That will happen either through a charity or recycling center. Junk King knows exactly where to drop off those items and will happily go the extra mile, literally and figuratively, to make it happen. Your first holiday wish of a junk free home can come true with one call to Junk King Birmingham. This entry was posted in Birmingham Junk Removal and tagged clutter, holidays, junk free, junk removal on October 22, 2017 by Junk King. Last updated October 22, 2017 .